Turbo 1-1w-2-4 professional machines represent the top-range of Gianni Ferraricollecting units and guarantee SUPERIOR PERFORMANCE UNDER ALL APPLICATIONS. These machines have been designed and built with regard to safety and reliability in every working condition. The machine and relevant equipment have been subjected to various tests and checks provided by the EEC regulations for safety, noise, vibrations and electromagnetic emissions. Several devices have been installed on the machine to ensure maximum safety. Compact and powerful. 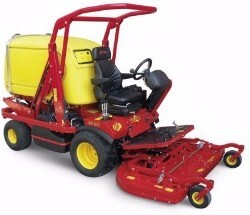 The latest Turbo 1 is extremely efficient on flat ground or on areas with slight slopes. A powerful 3 cylinder diesel engine and a large blower allow very high cutting speed and a very good cutting quality even with high, wet grass. A 1100 litre grass collector, together with a high dump elevator (dumping at 2.1 mt) will make your job extremely productive with a top speed of 18 km/h. Very compact, can easily work with obstacles and narrow paths. The Turbo 1W is provided with patented HTC™ (Hydrostatic Traction Control) 4 wheel drive for a perfect traction on hard slopes.